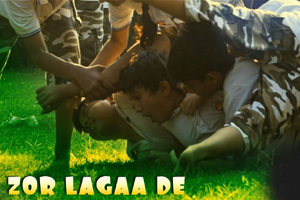 A motivational song sung by Jiggra and music composed by Samir - Mana. Star Cast: Aashi Rawal, Sharvil Patel, Mann Patel, Deah Tandon, Ugam Khetani, Stuti Dwivedi, Hardil Kanabar, Jimmy Sheirgill, Jignesh Modi. The video of this song is available on YouTube at the official channel Times Music. This video is of 2 minutes 14 seconds duration. Lyrics of "Zor Laga De"
Lyrics in Hindi (Unicode) of "जोर लगा दे"